Definition - What does Uttanasana mean? Uttanasana is a standing forward fold, which is considered very good for relieving stress and soothing the nervous system. It forms part of the Surya Namaskar sequences. Its name comes from the Sanskrit uttana, which means "intense stretch" and asana, which means "a seat" or "posture." 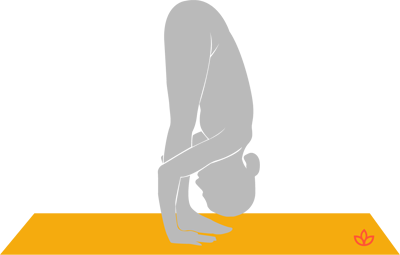 The Western name for uttanasana is standing forward bend. For a yoga pose, uttanasana is relatively new. It is first found documented in Mysore, India, in the 19th century within a Hindu text titled Shri Tattva Nidhi, but is not mentioned in the classic texts of yoga. It is closely related to the posture padahastasana, or “hands to feet pose,” with the difference usually seen in the hand positioning. In full uttanasana, the hands tend to come to the back of the ankles, while in padahastasana they are under the feet, although this does depend on which variation is being performed. Uttanasana is considered an important posture because, in addition to the physical stretching and strengthening benefits, it is believed to be balancing for the body. This is due to the combined elements of activity and passivity in the body once it is folded into the pose. Like all forward bends, uttanasana is believed to be calming for the mind. It is a posture of surrender and, as such, may teach one patience and acceptance. Furthermore, the increased blood flow to the brain and the inverted nature of the posture, with the heart above the head, is said to relieve stress.